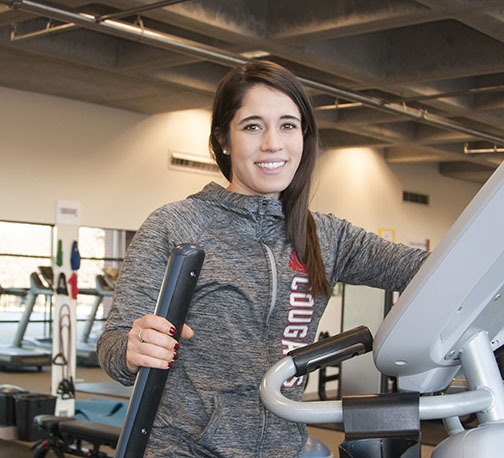 The job of managing the new fitness center on the WSU Spokane campus is in the hands of Maria-Ximena Hedrick, a graduate student in the Nutrition and Exercise Physiology program. Hedrick reports that peak use time at the gym on weekdays is between 2 and 5 p.m., although noon also can get busy sometimes. Peak times draw 10 to 13 students working out at the same time. “If you are flexible it is possible to pick a time when you have the whole gym to yourself,” Hedrick said. As she spoke, it was 9 a.m. on a Tuesday in the gym, and one student did indeed have the run of the gym. The most popular pieces of equipment are the treadmills, elliptical machines and dumbells, Hedrick said. One of her staff added that the functional trainer – a multi-station strength trainer – also is a favorite. The stationary bikes, however, will be returned to the equipment rental company in January and exchanged for spin cycles, which provide a better workout, Hedrick said. That change and a few others are being made after about 20 students completed surveys. 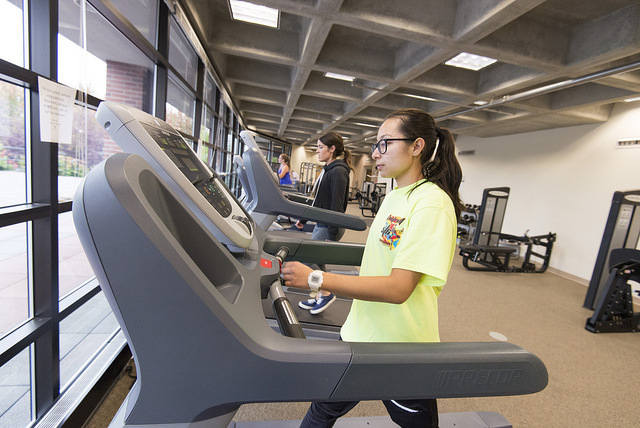 Hedrick works at the Fitness Center 20 hours a week and is a student in the Master of Science Coordinated Program in Dietetics, which she plans to finish in the spring. One of her internships this fall was 30 hours a week, so during that period, she was putting in 50 hours a week between the two jobs. Hedrick spent four years at Central Washington University in Ellensburg and completed a bachelor’s degree in Nutrition and Food Science. She ruled out food science after further research led her to see her interest was more in nutrition than food science, and after discovering further education in the field was located in places that were not going to work for her at the time. This is her first job in a gym, but she had acquired plenty of other experience before moving to Spokane to pursue the MSCPD. She taught the Food Sense state and federal government nutrition program in Snohomish County and also worked as a Spanish translator there for another Food Sense teacher. She worked as a diet clerk at Harborview Medical Center and spent a few years at Starbucks. Hedrick was attracted to the MSCPD program because she wants to become a registered dietitian, but also because of the exercise component, which was something she practiced in her own life but had never studied. Hedrick is assisted by five undergraduate students who work part-time at the center. Four of them are NEP students who have created several types of exercise and stretching classes now being offered. The classes and the times they are offered will evolve next semester in response to student feedback. 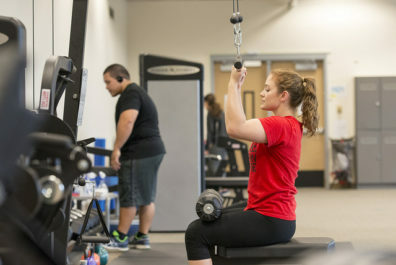 The gym is accessible to WSU Spokane and EWU Spokane students 24-hours a day, seven days a week. It is staffed from 8 a.m. to 8 p.m., although that may change next semester to 9 a.m. to 7 p.m. The 24-hour Fitness Center opened at the beginning of this semester and was required by the accreditation committee for the new Doctor of Medicine (M.D.) degree program.